In June my sister and I and our three nieces traveled to Maui for a trip-of-a-lifetime vacation! 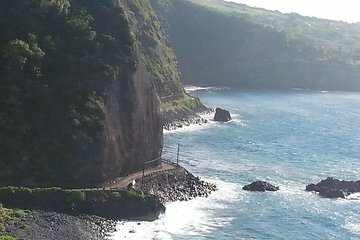 We decided to book the private 'Road to Hana' tour to accommodate my teenage nieces and their wish to see black-sand beaches and spend extra time at this spot. We were also able to determine the pace of the Tour and the preferred stops. David, our driver, arrived on time in a beautiful luxurious mini-motorcoach with snacks and beverages as promised in the tour description. He was a safe and conscientious driver, and most importantly, extremely knowledgeable on the history of Maui, Road to Hana and general tour information. It was a very long day, but I am so happy we decided to do the private Tour and highly recommend this tour company and our driver David! A great day from start to finish. We arranged to be picked up at 8am and that is exactly when Denis met us. He was extremely friendly and was determined to make sure that my husband and I had a great day. This was one drive we didn't want to do and Viator found a great local company to do this for us. During the day, we made stops at places that we had researched as well as places that Denis suggested. If you have any trepidation about doing this drive, take this tour! As a bonus, the water and snacks are a great touch!